Robust Wall Mounted workstations for areas tight on space | Altus, Inc. Tight on space? Our wall-mounted workstations are built to compactly fold against the wall when not needed, but also allow easy sit to stand charting while providing a great triangle of care. Our wall-mounted workstations allow the caregiver to sit or stand beside the patient and easily share information. 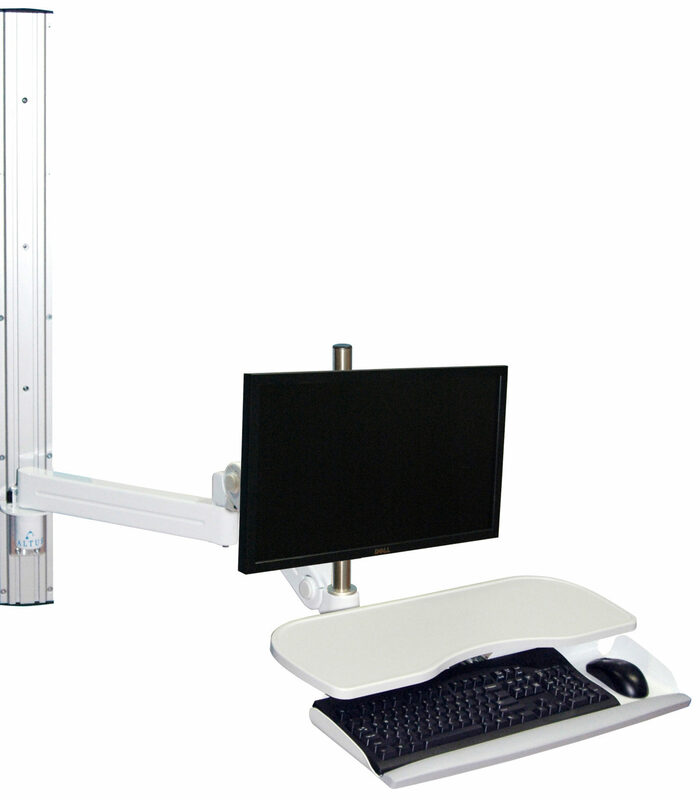 The ability to swivel/rotate the workstation not only creates a healthy work environment for the caregiver, but also gives the patient a stress-free visit. 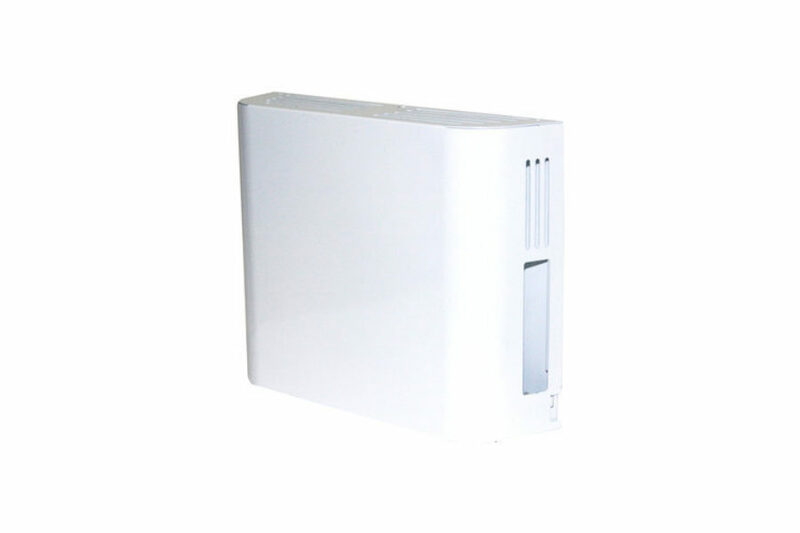 Stores within 10" from the wall, keeping your space clear from obstacles. A one-piece keyboard platform with soft wrist rest for comfortable typing and mousing, includes an enclosed storage area for the keyboard and mouse. Optimal technology access, effortless positioning of the monitor and keyboard. Adjusts to each unique caregiver to provide the ergonomic comfort that is needed for each task. 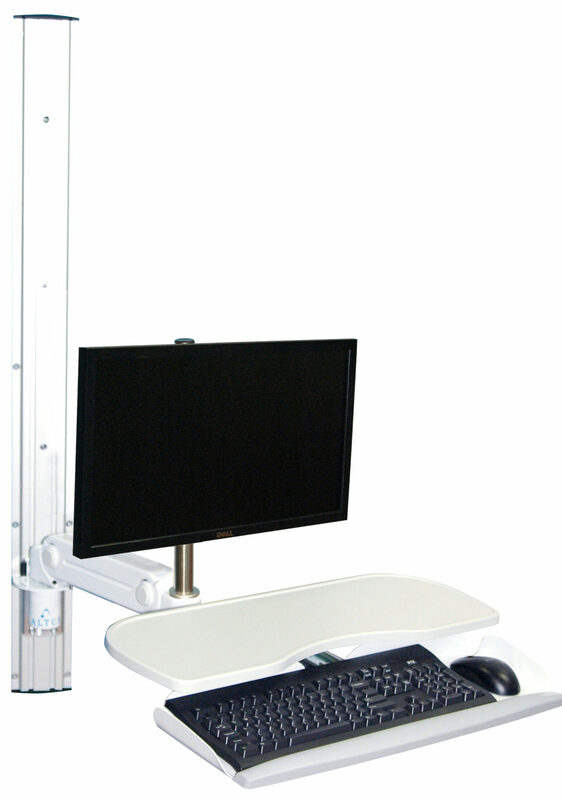 14” of height adjustment allows caregivers to sit or stand. Caregiver and Patient interaction is critical! Not only will the patient's perception of the visit be improved, but it will also aid in creating a stress-free environment. 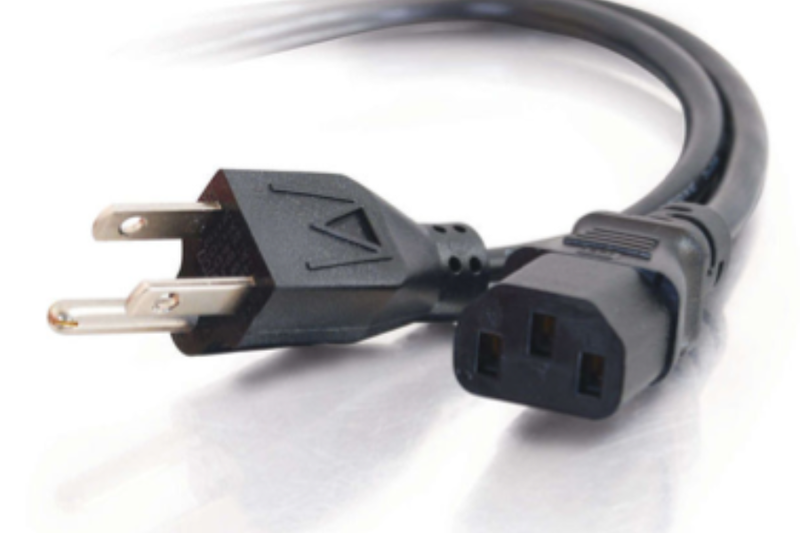 The swiveling monitor and an extension of up to 59", provides the optimal triangle-of-care between the patient, the caregiver and the technology. 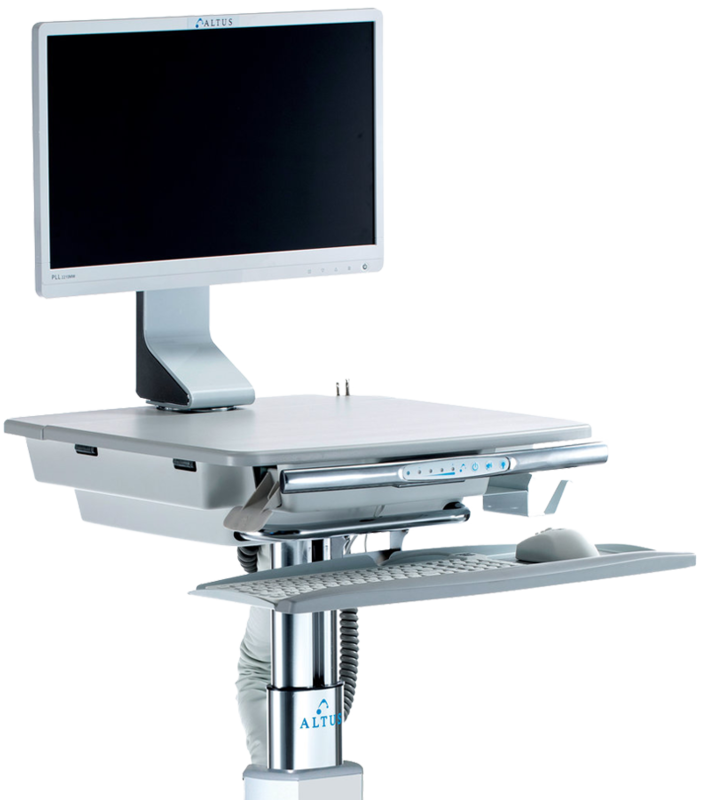 Position the monitor and keyboard to accommodate clinician data entry or patient communication needs or extend the workstation to invite patient engagement and to give the caregiver flexible positioning in any environment. Upgrade Altus Reach. 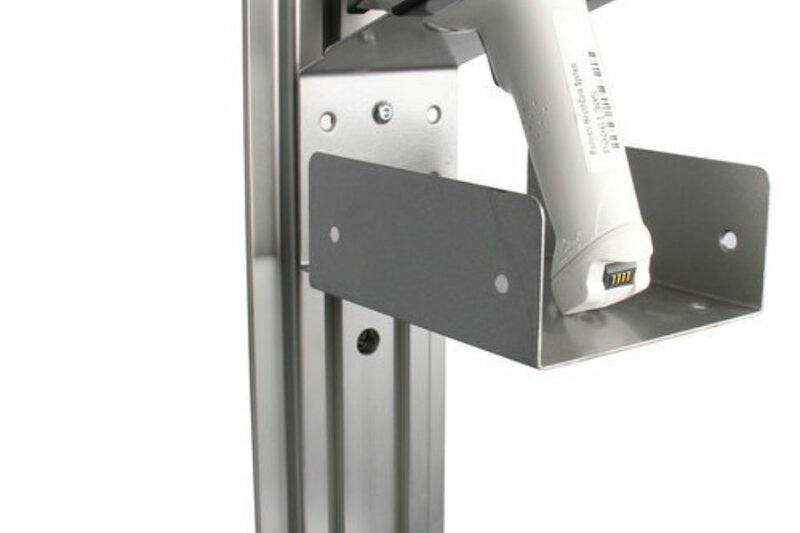 Add a bar code scanner and charger holder to your track mounted workstation. 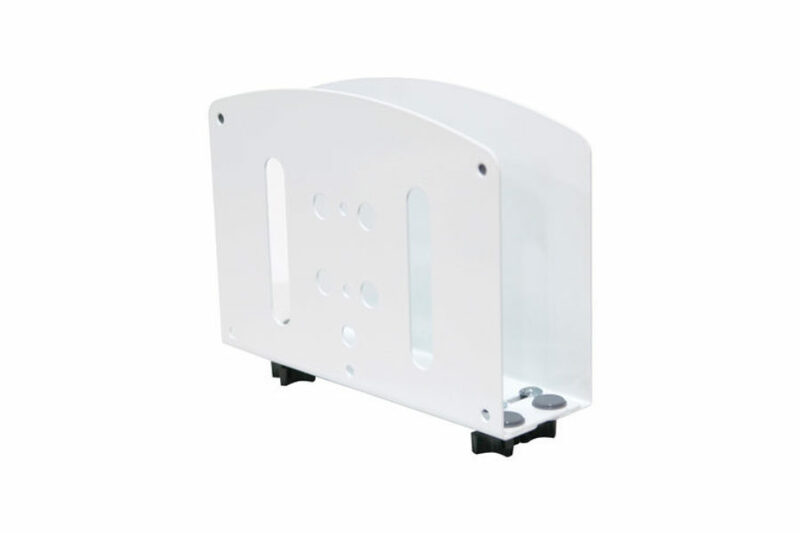 The holder includes a universal interface for attaching a scanner base at a convenient height. Space saver. No more interfering with the worksurface or workstation surroundings. Located on the track for easy access, keeping clinicians on the move.